Every so often a server comes into our lab that crosses the line thoroughly in the realm of being extraordinarily interesting. 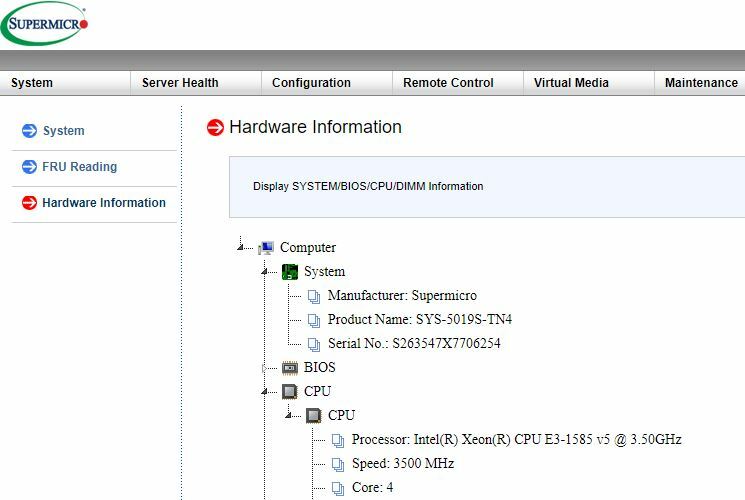 The Supermicro SYS-5019S-TN4 is one of those servers. It combines a surprisingly fast CPU, with Intel’s top GPU of its generation, with a 1U form factor for dense deployment scenarios. The front of the SYS-5019S-TN4 is essentially a large air vent with power/ reset buttons and status LEDs. Instead, we wanted to focus on what is inside the system. The 1U chassis is only 9.8 inches deep so it should fit in most telco racks mounting via the rack ears. 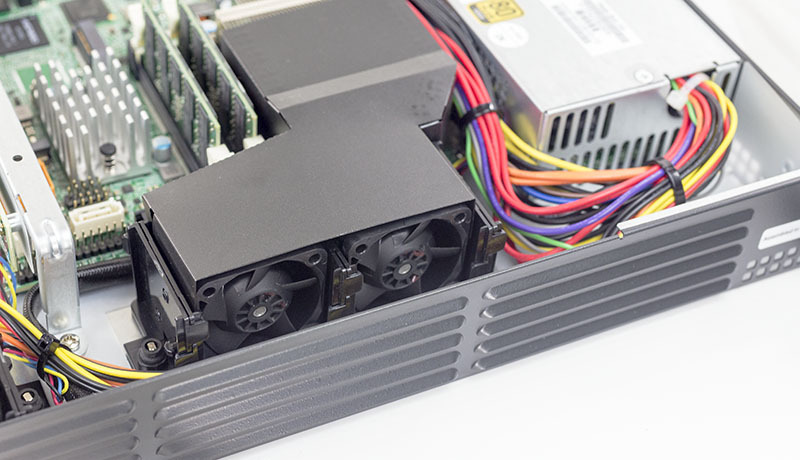 Inside the CSE-504-203B chassis, there is a 200W 80Plus Gold PSU along with cooling and a Supermicro X11SSV-M4F motherboard. We did want to briefly show off the cooling as there is a lightweight custom shroud that ducts airflow from two chassis fans through the CPU heatsink. 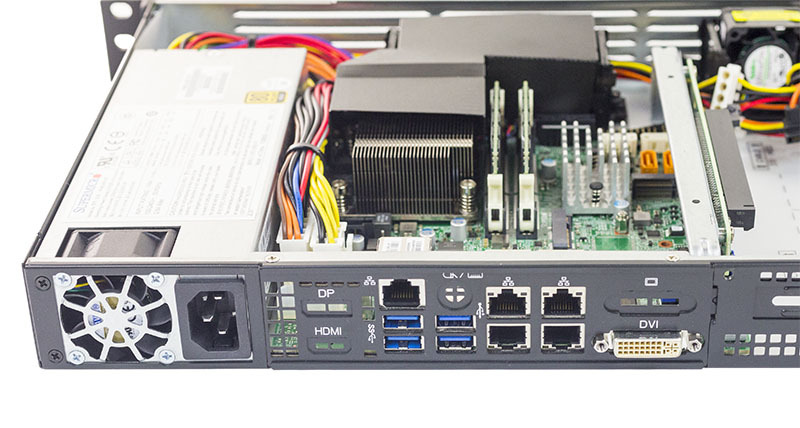 This provides redundant cooling to the CPU and allows Supermicro to leverage a standard chassis. The CPU area has two SODIMM slots which provide for up to 32GB DDR4-2133 ECC capacity. The Intel Xeon E3-1585 V5 is a 4 core / 8 thread 3.5GHz base clock / 3.9GHz turbo CPU from the Skylake generation. 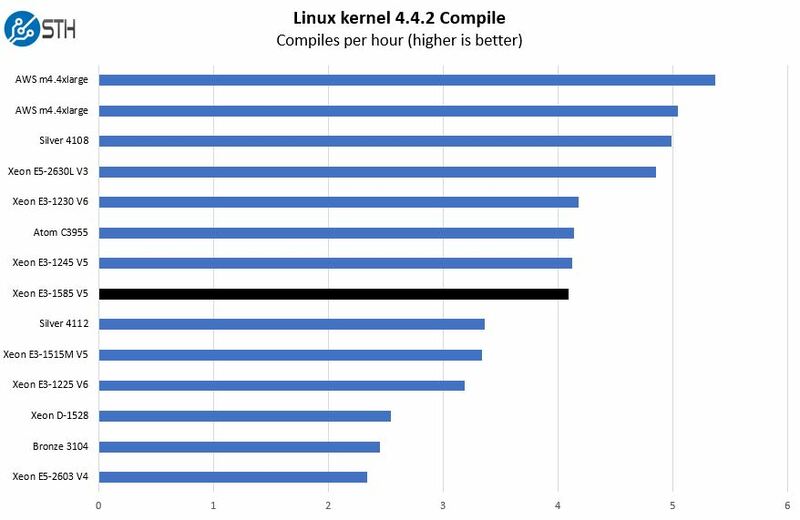 That core count and clock speed allow it to remain extremely competitive, from a raw CPU compute perspective, with the Intel Xeon Silver lineup on the server side. 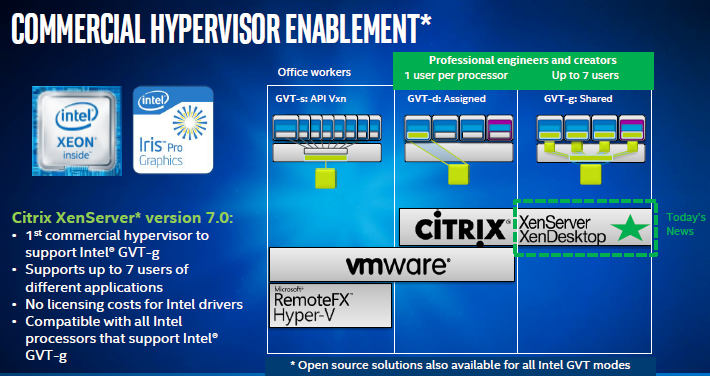 Unlike with desktop Skylake generation CPUs, the Xeon E3-1585 V5 supports unbuffered ECC memory. One of the other major features is the Intel Iris Pro Graphics P580. Unlike the Xeon E3-1200 series graphics, this comes with 128MB of on-package DRAM as well as a much stronger GPU base. 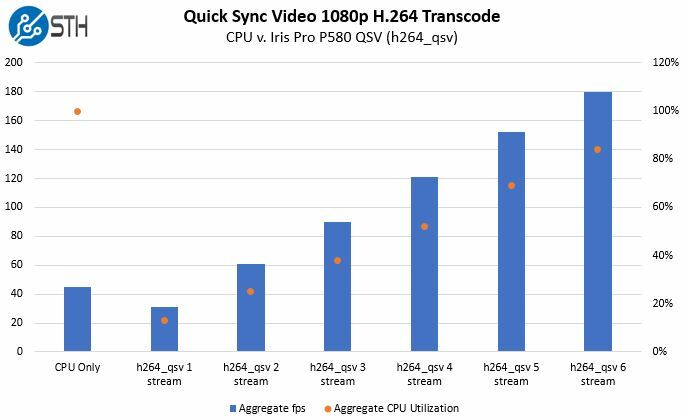 We are going to discuss how this impacts Quick Sync video encoding, but it also allows for features such as Intel GVT-d/ GVT-g for VDI solutions which are a lower cost solution for graphics virtualization than NVIDIA GRID. Moving onto the onboard storage there are a few key features. First, there are four SATA III ports, two are Supermicro orange colored meaning that they can provide SATADOM power without an extra cable. Aside from the four SATA ports, there are mPCIe and m.2 slots on the motherboard. The mPCIe slot can also act as a mSATA slot for SSDs. The m.2 slot offers PCIe x4 for NVMe devices or SATA support and can handle up to m.2 2280 (80mm) devices. About half of the chassis interior is dedicated to expansion and storage. We wanted to take a look at this section which has its own dedicated fan. There is a PCIe 3.0 x16 slot on a riser (single slot) and room for two 2.5″ SSDs. The chassis can also be configured with four 2.5″ SSDs or support for 3.5″ HDDs depending on requirements. Ours simply had two fixed 2.5″ mount points which allow for taller PCIe x16 cards to be installed. Moving to the rear of the unit we see a number of I/O options. Gone are legacy VGA and serial ports. Instead, one has a DVI port as well as four USB 3.0 headers. 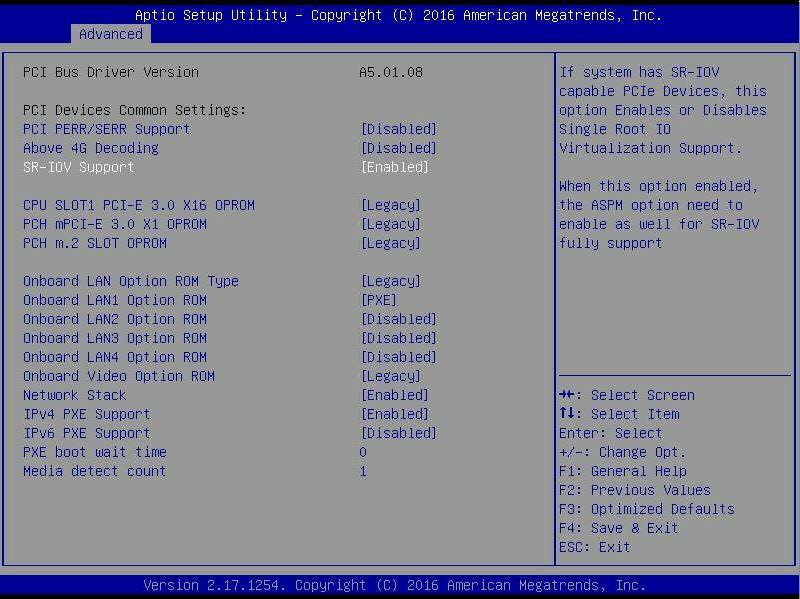 There is another internal USB header for a boot device if required. As you can see, there are three different NICs being used. The Intel i219-LM is the chipset gigabit Ethernet NIC. The Intel i210-AT NIC is intriguing because it also can act as the management interface when set to a shared NIC configuration. The last two ports use high-end Intel i350 gigabit networking that has additional features for virtualization and offload. This platform should be close to what we expect users to configure. One suggestion we would have is to move to 2x 16GB ECC SODIMMs to increase memory capacity to 32GB. We already published Intel Xeon E3-1585 V5 benchmarks but we wanted to simply show a few here. Please see that linked piece for more information. Here the high clock speeds allow the system to be faster than the Intel Xeon Silver 4112 (~$500 85W TDP) CPU as well as the 16 core Intel Atom C3955, the top of this latest generation. 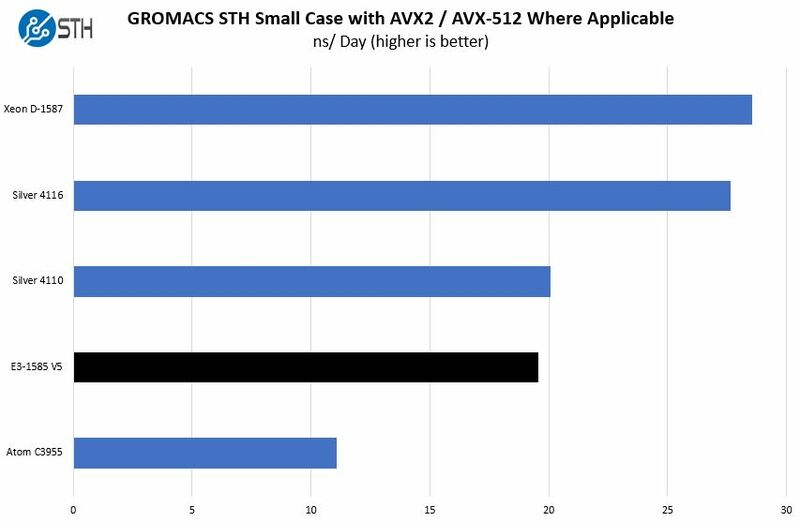 High clock speeds allow for solid AVX2 performance as we can see it runs neck and neck with the Intel Xeon Silver 4110 an 8 core server part with AVX-512 enabled. 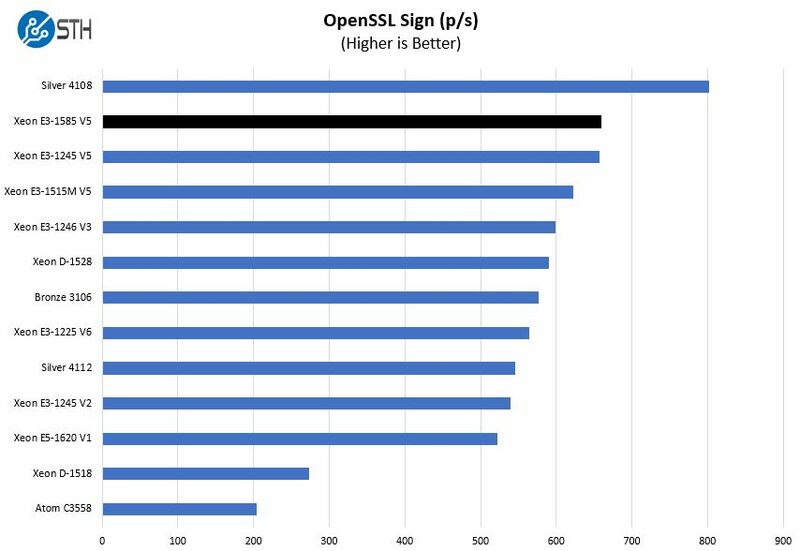 We expect these to be deployed running applications with OpenSSL regularly. 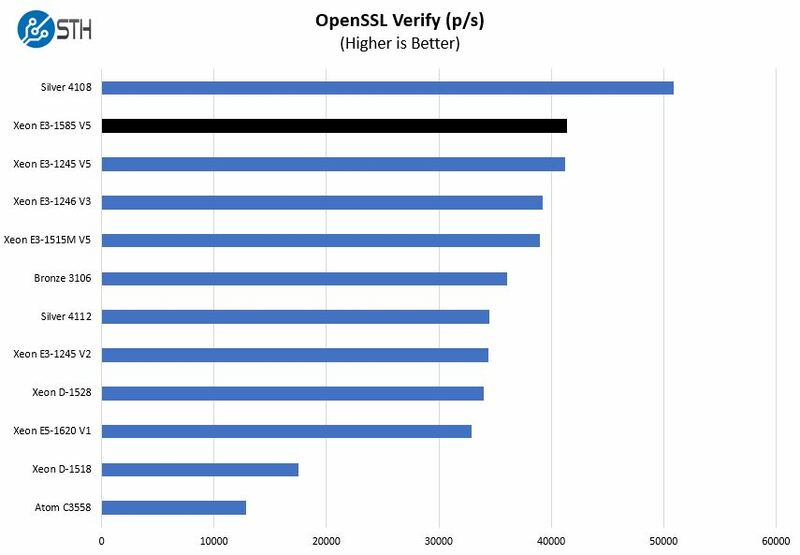 The high clock speed allows the CPU to punch above its core count in the OpenSSL sign and verify tests. One of the major benefits of this configuration is the external GPU. We used ffmpeg with the Quick Sync GPU offload for transcoding video and saw a massive increase in the number of streams we could handle. Getting Quick Sync support for ffmpeg requires a bit of driver and codec work but the results are solid. It took us about two hours to get working and we switched from Ubuntu to CentOS to ensure dependencies were met. While we got great results, we understand that there are additional tuning opportunities to get even better performance. We expect that these systems will often find their way into video transcoding server banks. 3x 1U fans add to power consumption without a doubt, but the numbers are low enough that they should fit in even commodity colocation racks. 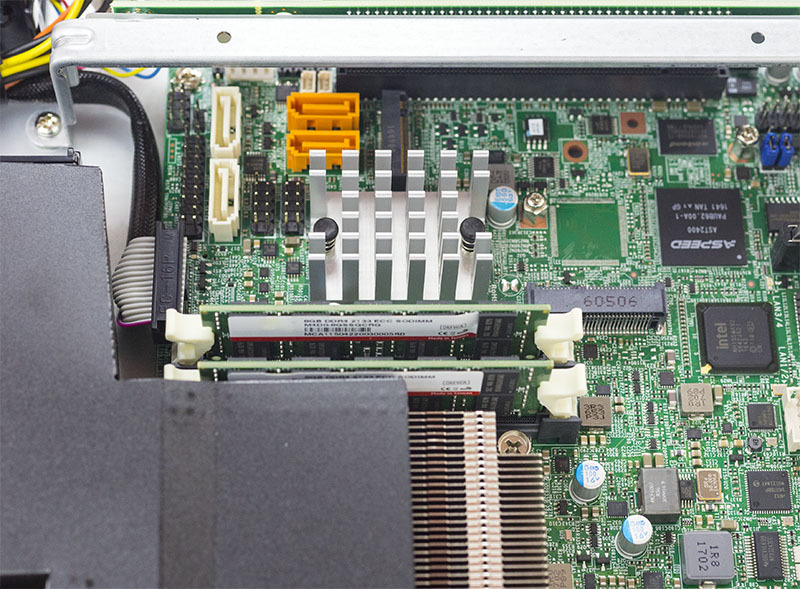 If you want to build a low-cost transcoding operation, these servers are a good fit. The small size means they can fit even in shorter depth racks. We do think that the fan speeds can be tuned further via IPMI thresholds to lower power consumption significantly. The fans run fast enough that the chip stays cool but the noise is noticeable even in the data center. If you are installing these servers in a retail or office equipment cabinet, we suggest looking at fan curves. In the latest generation of Supermciro IPMI is an HTML5 iKVM. 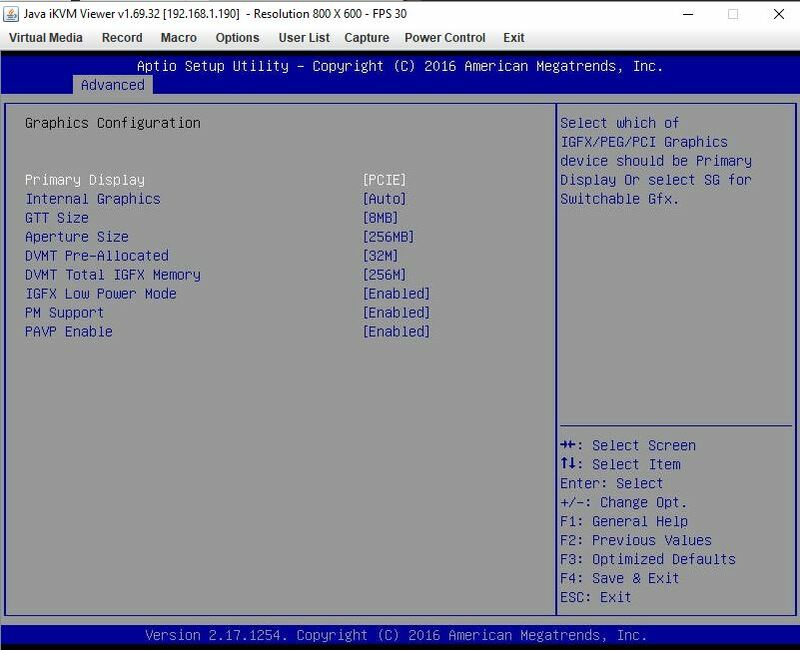 One no longer needs to use a Java console to get remote KVM access to their server and do things such as edit BIOS settings. Overall this is a great performing server that exceeded performance expectations. The Intel Iris Pro P580 GPU offered excellent Quick Sync performance, however, we do wish that the offload was mainlined into applications. The small form factor and the ability to fit in virtually any colocation power budget make it an intriguing option. Without hot-swap bays we strongly suggest using SSDs as they have higher reliability rates. We also wanted to point out that this is a configuration where we suggest purchasing the complete system over the parts. Having the correct air duct, as an example makes assembly much easier. At around $1100 street price, one can see the value over a standard E3-1200 system with a PCIe GPU. Beyond the initial purchase price, the lower power consumption should directly equate into better TCO than higher-power options. 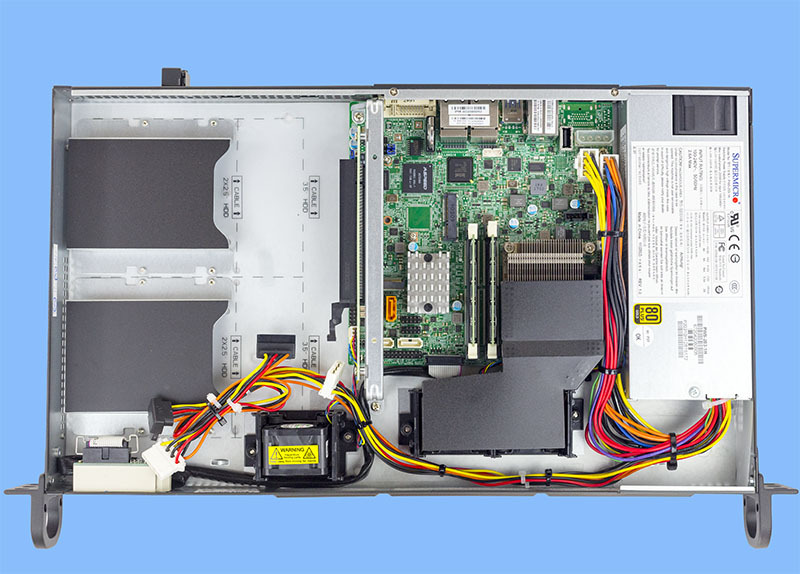 The Supermicro SYS-5019S-TN4 packs a ton of CPU and GPU power into a low power, compact 1U package. First mention of the CPU model says it’s an E5…rest say e3.